Upgrade your ironing board with these clever options. Attractive ironing boards? We thought this wouldn’t be too difficult to find—until we started looking. Oh, boy. Looks like ironing-board designers might be the same folks responsible for crafting Grandma’s drapes; they certainly share the same cheesy floral design scheme. But, if you dig deep enough, you’ll uncover a few gems worth putting on display. First of all, your current ironing board probably works fine—it’s just ugly. What you need is an ironing-board cover. Etsy.com offers plenty of acceptable options: tasteful, not over-the-top flowers, bright chevron stripes and animal prints (they’re still putting a bird on it, yo). There’s also over-the-door ironing boards, which can hang discreetly on your bedroom door. They cost around $28 at places such as Target. If you own your place, or have no plans to move anytime soon, you could get a custom closet, which includes a hidden ironing board that swings out from a shelf, installed in your apartment. Rates vary, and the service is offered at morespaceplace.com and chicagolandcustomclosets.com. 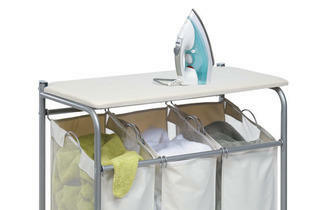 Something a little more practical is the Ironing Sorter Laundry Center ($87 at homedepot.com). The hamper features an ironing board on top, and includes wheels so you can roll the whole thing down to your building’s laundry room. Just replace the hamper already in your closet with this guy. And finally, on Pinterest, we found a cool standing mirror which turns into an ironing board when flipped over. It looks like it’s still in the prototype phase, but we’d definitely donate money to this Kickstarter…just saying. Have a shopping and style conundrum? E-mail us with “personal shopper” in the subject line at shopping@timeoutchicago.com.